I am seriously bummed the weekend is already over! I was having way too much fun! with a 3,200 meter swim. I actually got out of the water way earlier than usual. Ha! 32*200 or 3.2 miles or something crazy like that! so I was having this party in the pool all by myself. I didn't care one bit. Still had a blast! it was time to ride 32 miles with my training buddy Karen. so Karen wouldn't have any excuse to bail on me. because the plan called for a bunch of 2 mile repeats. It's Karen's plan - not mine - we are following these days. Coach M: I figured you could hang! I took many useless self-portraits. so I had plenty of time to play around. Lovely views, great pace, perfect company! What more could a girl ask for on her birthday? because I hadn't packed a thing for our weekend trip. until leaving town at noon. I don't like stress. So I cancelled the ride. and had another party by myself on the spin bike for 32 miles. having a nice birthday morning with the family. that I wasn't going to pull off 32 running miles on Saturday. would still count for 32 birthday miles. This was my party and I was in charge of the rules. came back to volunteer at the Mustang Gallop, ran home. Time to pack up and hit the road. 6 painfully slow hours later we made it to our destination. and fun friends! Lucky me!!! Have I mentioned that Coach HT was there? You certainly wouldn't want to miss him! 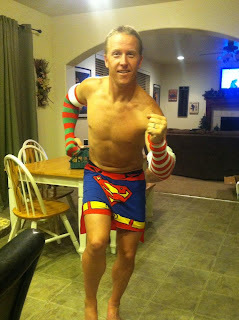 He did indeed run the entire marathon in this very outfit! in a couple of days, I am going to tell you about the marathon in my next post. Hey, if I'd known you were posting pictures I woulda fixed my hair. That was a great b-day ride!!! How adorable - THIRTY-TWO. Remember that for mine, we're going to be doing everything times *FORTY-SIX*. Shut up.